A trip to the 1987 College World Series championship game on the line and down by three quickly, Stanford couldn't wait. So, in came relief pitcher Al Osuna - with one out in the first. Osuna came through. He pitched 8.2 innings in relief and didn't allow another run, according to The Omaha World-Herald. "I just wanted to get the first guy out to establish myself," Osuna told The World-Herald afterward. "I didn't want them to score any more runs. I wanted to turn the faucet off right there." Osuna established himself in that game and he soon established himself in the pros. Starting with the Astros at short-season Auburn that year, Osuna made his way to Houston by the end of 1990. By the time his career was over, he'd seen time in six different major league seasons, getting into 218 total games. 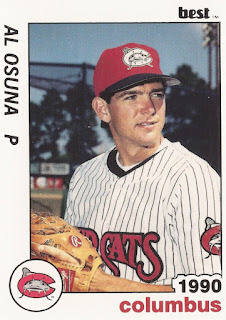 Osuna's career began that year in 1987, taken by the Astros in the 16th round of the draft out of Stanford. Osuna started with the Astros at Auburn and single-A Asheville. In 22 total relief outings, he posted a 4.08 ERA. He first made AA Columbus in 1990, after two full seasons at single-A. In September 1990, he made the jump to Houston. He got into 12 games down the stretch for the Astros in 1990. He gave up six earned in 11.1 innings of work. Osuna returned for 1991 and became a regular. The reliever got into 71 games, saved 12 of them and had a 3.42 ERA. In August, he pitched two innings without giving up a hit, getting the win. He also struck out the Dodgers' Darryl Strawberry, according to UPI. "When we played L.A. back in May, and I struck him (Strawberry) out, my father told me that he said (in the paper) I didn't throw him anything he couldn't handle," Osuna told UPI afterward. "So every time I face him, he's going to see everything I've got." Osuna picked up another 66 games for the Astros in 1992. He went 6-3 in middle relief, with a 4.23 ERA. He got into 44 games in 1993, with a 3.20 ERA. In May 1993, Osuna got Dave Magadan of the Marlins to pop out with the bases loaded in a close game. "I was a little surprised he went after the first pitch," Osuna told The South Florida Sun-Sentinel, "and I think the ball moved in on him a little bit." Osuna moved to the Dodgers for 1994, getting into 15 games. He played 1995 at AAA and briefly in independent ball before returning to he majors one last time with the Padres in 1996. He got into 10 games there, with a 2.25 ERA, ending his career.